Many girls willingly accept sore feet as a part of life upon becoming a teenager and getting that first pair of heels… Depending on lifestyle, location and chosen footwear, sore feet are a mainstay and can even occur after hours of walking around in the trustiest pair of comfy flats or boots. Dryness, cracked skin and calluses are the price to pay for wearing cute shoes, but as they say… C'est la vie! There are lots of things we can do for relief from hot baths to pedicures, but sometimes there's just not a lot of time for such frivolity. I mean, who isn't busy these days? 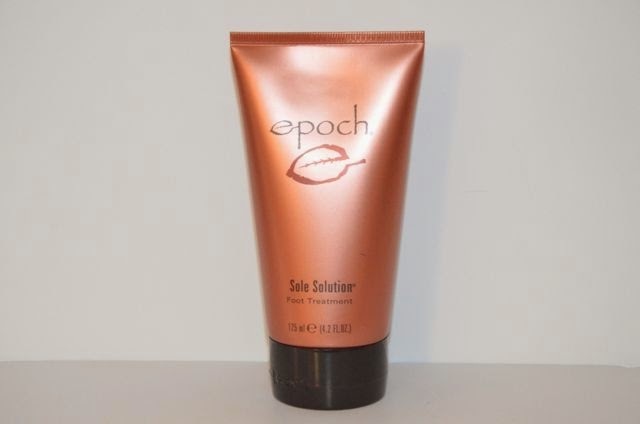 Luckily Nu Skin has our back on this one with Epoch Sole Solution. Featuring crushed allspice berry which is traditionally used by the indigenous people of Central America to relieve the dry, cracked, red skin on their feet, Epoch Sole Solution is a rejuvenating foot cream that soothes, heals and rejuvenates tired feet. I love Epoch Sole Solution and I find I get the best results putting this on my feet before bed underneath a pair of Superdrug Pebbles Moisturising Socks that I picked up at my local Superdrug for just £2.99. Aside from general use for moisture and healing, I also love using this product after a hard day of running in heels. It has a sort of hot & cold warming feeling, smells of allspice and soothes tired sore feet no matter how high my heels were that day. I'd definitely recommend this for anyone who wears heels a lot or is constantly on their feet. Epoch Sole Solution is £20.71 online and available via Nu Skin.